Star Wars: The Last Jedi is only a few weeks away. Motion capture maestro Andy Serkis has taken some time to talk about Supreme Leader Snoke in a new interview that gives us some insight into what fuels the mysterious villain. Even as the release date for the movie gets closer, there's still a whole lot about Snoke that we do not know and director Rian Johnson has said that we won't get much of a backstory for him in The Last Jedi, citing that Star Wars fans didn't know Emperor Palpatine's history until the prequels came out. While we might not be getting the entire history of Snoke in the upcoming movie, Andy Serkis has provided us with the best insight into the character so far. Andy Serkis recently sat down with Entertainment Weekly to discuss his Snoke character and what drives the villain in The Last Jedi. As it turns out, the deformed Supreme Leader Snoke has suffered injury, which we already knew about from all of the scarring, and is very vulnerable and "wounded" according to Serkis. These wounds offer a personal hatred to the battle against the Resistance, which he is bringing in full force (no pun intended). Serkis had this to say. "The thing about Snoke is that he is extremely strong with the Force, the dark side of the Force. He's terribly powerful, of course. But he is also a very vulnerable and wounded character. He has suffered and he has suffered injury. The way that his malevolence comes out is in reaction to that. His hatred of the Resistance is fueled by what's happened to him personally." The 9-foot tall alien/humanoid is reportedly also not very satisfied with Kylo Ren's (Adam Driver) work so far as Andy Serkis points out. A lot of Snoke's anger is directed at Kylo Ren because Snoke does not respect the weak. Serkis had this to say. "His training of Kylo Ren is not yielding what he wants. Therefore, his anger towards Kylo Ren is intensified because he can't bear weakness in others. Part of the manipulation is goading him with Hux and playing them off against each other." This is more than likely where the test for Rey comes into play in The Last Jedi. 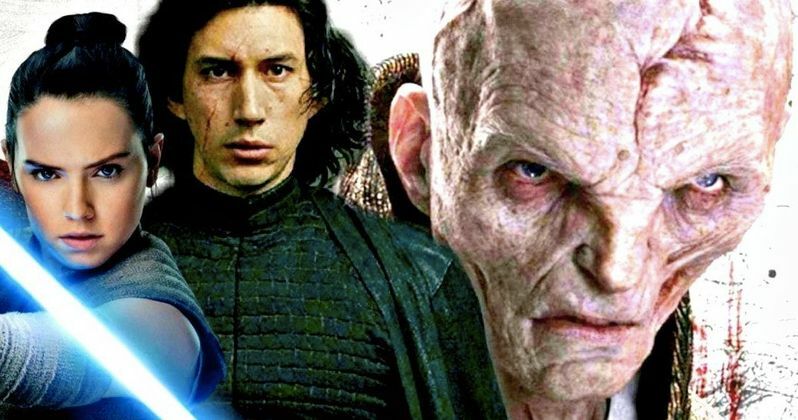 Daisy Ridley has said in the past that Supreme Leader Snoke is the ultimate test for Rey, who may even be stronger in the ways of the Force than Kylo Ren. Since Snoke only appeared as a giant hologram in 2015's The Force Awakens, this will be the first time that we will see him in real-life, so to speak. Andy Serkis says that we'll be able to see the physical damage and how it affects the character. He explains. "You witness his physicality. His body is kind of twisted up like a corkscrew, and so he has limited movement. His aggression and his anger is contained and restricted by that physicality." To play the character just right, Serkis taped down one side of his mouth to mimic one of the facial wounds that Snoke has. Serkis says that they used tape to restrict the left side of his jaw to reenact Snoke's mauled jaw. According to Andy Serkis, most of Snoke's, "deformity is very much based on injuries from the First World War, from the trenches." This is the most information that we have seen on Supreme Leader Snoke thus far, but there's still a lot more to learn about the mysterious and intriguing character. Andy Serkis also hinted at some "flamboyance" and a taste for the "finer" things in life for Snoke, which are shown off in his throne room and golden robes, but one has to wonder where exactly that comes from. Maybe we'll get more of an explanation in Episode 9, but until then, check out more of what and Serkis had to say about Supreme Leader Snoke courtesy of Entertainment Weekly.